It was back in November that KOAC learned of Caroline’s condition through a mutual friend of some of the trustees. This seemed particularly cruel given that the festive season was just around the corner. So we decided to organise a Christmas treat for Caroline! 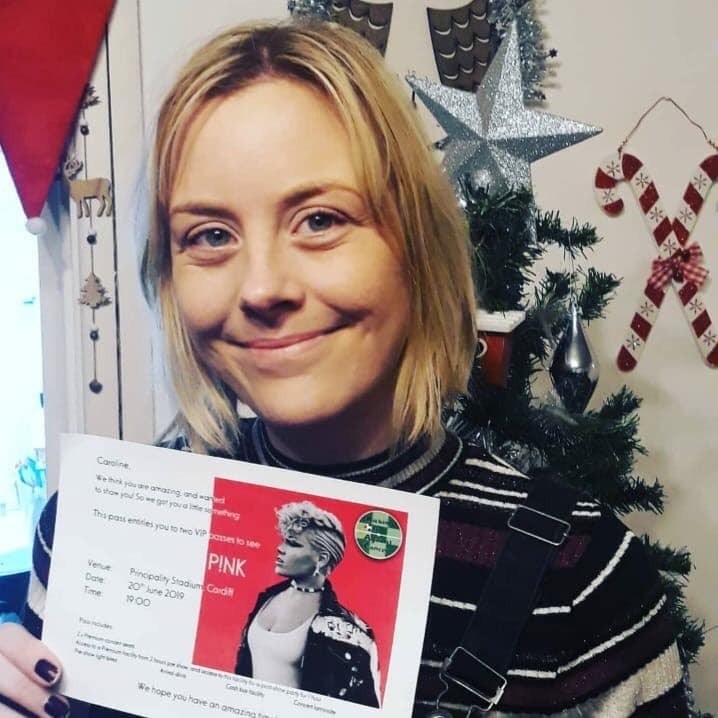 We were able to find out that Caroline was a massive fan of the singer Pink, who is about to embark on a tour including UK stadium dates. VIP hospitality tickets were viewed as the perfect treat that could hopefully lift Caroline’s spirits whilst she was undergoing treatment over the festive period and as you can see by her reaction below, she was delighted! This is where the money you raise as a follower of Kicking Off Against Cancer is spent, on making types of memories like these. We aim to pick people up in their darkest and hardest times. Hopefully providing memories that will last a lifetime. Ones that will momentarily take people’s mind off this terrible disease. Your kind donations and fundraising really does make a difference.